Having a great personal-size carry-on bag is important. I like to have one that I can also use as a weekender or can doubles as a work bag as well. Travelon has made a point to design bags that adapt to the different ways people travel. I have several of their carry-on bags and now have two versions of the React Tote. I love the first and the new one has only been improved by the changes, making this a bag you'll want to take everywhere with you. I had the privilege of using the React Tote on my last trip and was greatly impressed. As with all Travelon bags, the handles are nicely padded, so you don't want to carry around a bag on your shoulder that digs in and makes you angry. Nobody wants to be unnecessarily stressed out and irritated while traveling, right? The straps are also short enough that you can carry it by hand if you like. When you aren't using this tote to travel or carry back and forth to meetings, you can use it as a workout bag or something equally handy. The polyester fabric is stain and water resistant, too. You can just wipe it down if it gets dirty. If you like to have everything in its place when you travel, then the React Tote is for you. 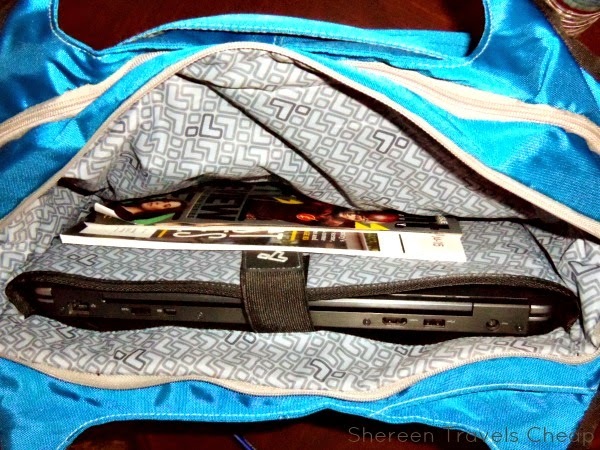 It fits up to a 15-inch laptop in its own padded compartment, with plenty of room for other important things on that side of the bag, like magazines, games, paperwork or adapters. 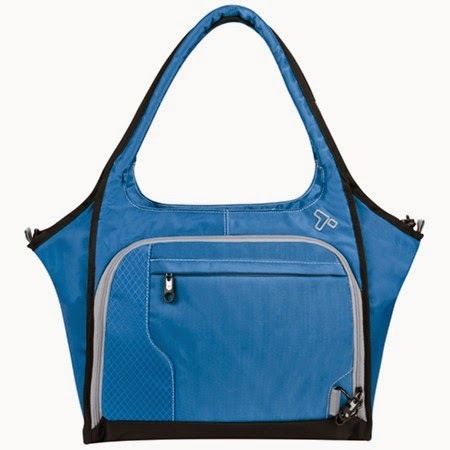 The other main compartment of the React Tote is roomy as well, and includes a mesh pocket, for items you like to be able to see without having to dig around inside. I always use these for headphones or snacks, making them easily accessible. 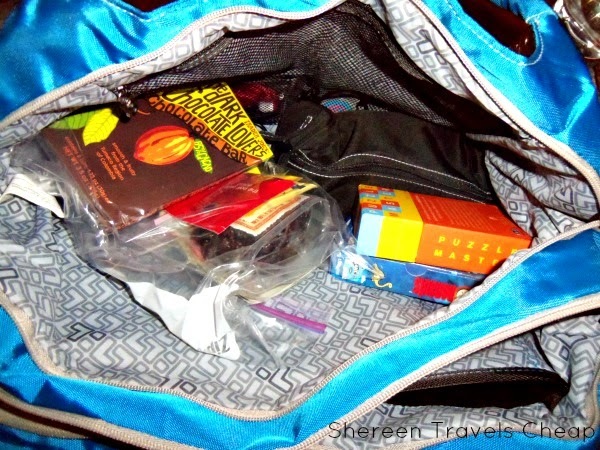 As you can see from the photos, there is quite a lot of room inside both main compartments, because the bottom of the bag is wide and gives it a nice footprint. 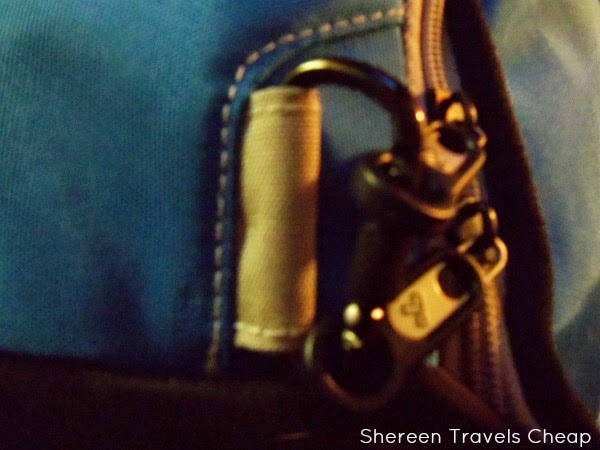 Both compartments have double zippers which can be locked by way of carabiners, leaving your bag safe from pickpockets. I like that there is one on each end of the bag, so you can choose to lock them both on either side - whichever is more convenient for you when you carry it - or one on each side to switch it up. Travelon really takes your security seriously, but doesn't want it to be inconvenient for you, just to thieves. It has the signature slash-proof lining and shoulder straps, too. Like to keep things like your tickets, phone, pens and passport within easy reach? So do I. The front zippered compartment of this tote is really perfect for small items that you want to keep close at hand, but also safe from others. 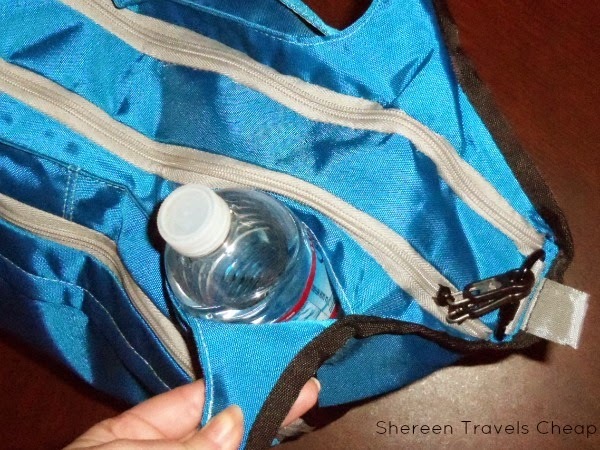 This compartment locks as well with a carabiner, and also has pockets for all your necessities. 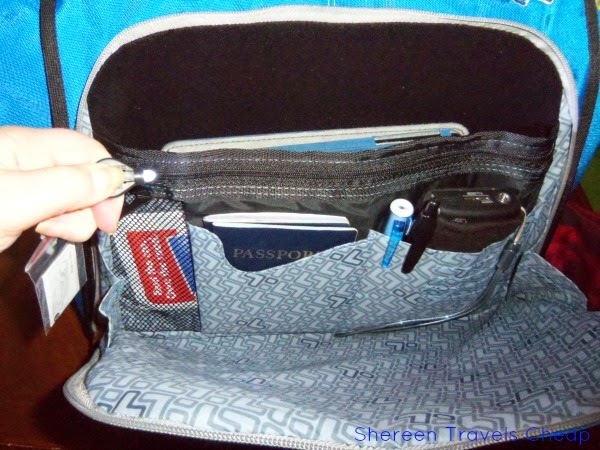 A large slip pocket for things like your iPad or travel paperwork, a zippered mesh pocket for makeup, change or other little things that may get lost elsewhere, two smaller pockets for your phone/camera (in my case, my flip camcorder) and your passport and credit cards. The passport pocket and card slots are RFID-blocking, so no one can steal your personal info - because wouldn't that be annoying to deal with on vacation? This is also where I kept items I like to have with me at all times - my sunglasses and a scarf for keeping warm on the plane. 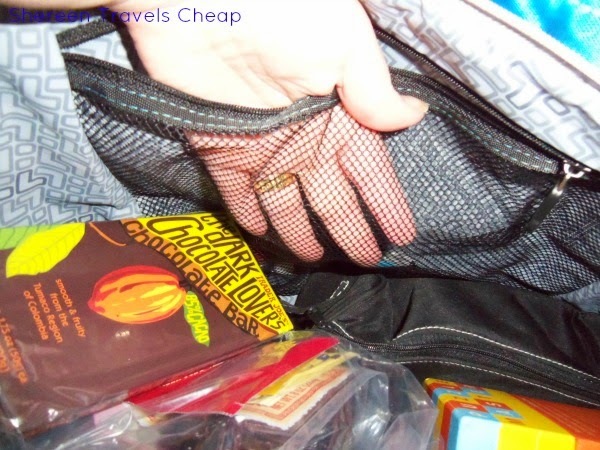 And Travelon knows that visibility is not always great when on a darkened plane or trying to find something in the car, so they've added their sweet little flashlight, helping you see things in the bag without annoying other people. It may not seem like a large enough light, but when paired with the lighter, slightly reflective fabric inside, it's just what you need. I've had tote bags where you pretty much have to pull everything out of it to find that one thing you need. Not with the React Tote. The zippered compartment has it's own smaller zipper pocket on the front. I kept my boarding passes and a map of the airport in it, but it would be ideal for keeping all the stuff in your pockets in it when passing through security. Maybe you'd like to stash your camera in it, so you can quickly grab and snap photos. It's a good size, but not too deep, so you can't get anything out of it, and not too shallow that you can't get your hand inside it. One of the things that irks me about many carry-on bags that have shoulder straps and no wheels is that they don't have a way to attach it to your wheeled carry-on. I mean, really? It isn't asking much to be able to not have to carry your tote. 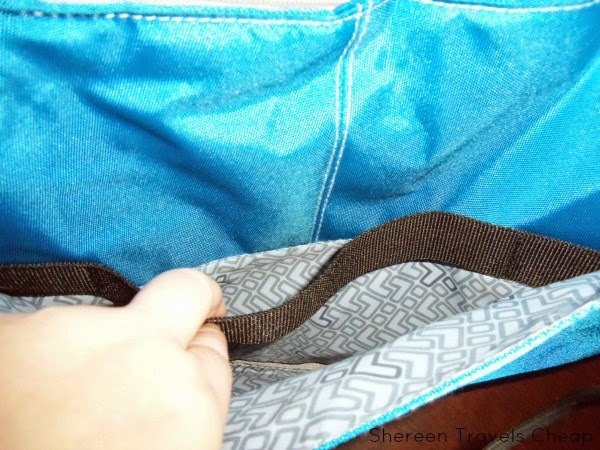 Not only does Travelon bags feature these slip pockets on the back to slide onto the handle of your main bag, but they have made this even better with two things: There's an elastic strap inside that helps to keep the bag snug to any size handle. If you have a thicker pull-out handle, you may not want to use it, as it can be a bit of a struggle to get it to come off again (but at least it won't fall on the floor!). 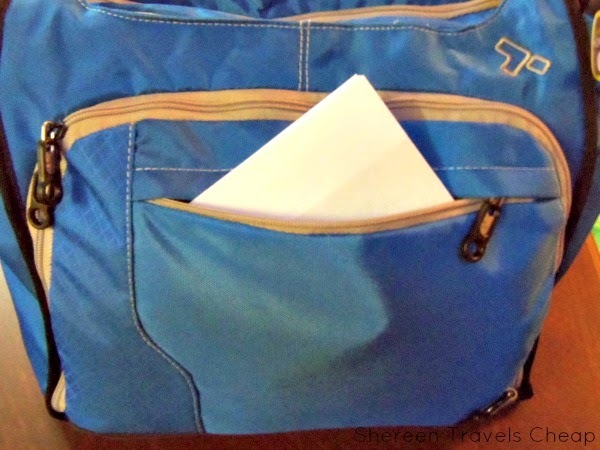 The bottom of the pocket has a zipper, so when you aren't using it as a second bag, you could use it as a grab pocket for items you want to use easily. It's a great place to shove your scarf or the book you're reading, or both. We always have a bottle of water with us. I love the normal mesh bottle holder pockets that most of the other bags have, but sometimes they get in the way. 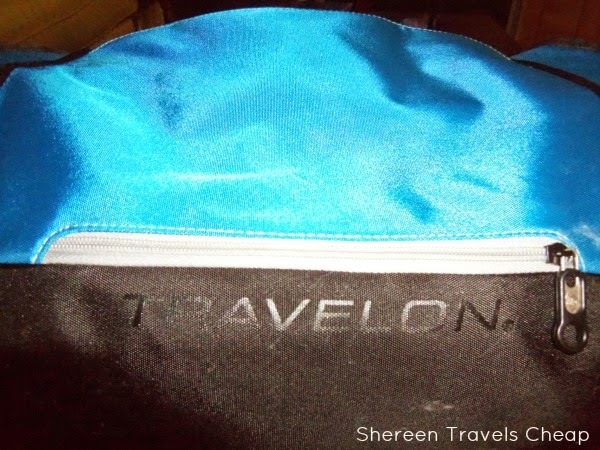 Travelon solved this by putting the pocket inside the bag, but still with easy access to it, because it's incorporated in between two compartments, which also helps to keep it cooler longer. It's just perfect for a regular sized water bottle, so it doesn't get lost in there and make it hard to get out. The tote slides easily under the airplane seat, without having to put it on its side, like some other bags, so you'll still have room for your feet. It also fit nicely to my side when carrying down the aisle, and I didn't almost hit anyone in the head. That made me happy, and probably all those people on the plane I didn't accidentally abuse.Plus, the awesome construction of this bag will keep it traveling with you for many years to come. Size: 15" x 13" x 5.75" | Strap Drop Length: 10.25"
Disclaimer: I was provided with the Anti-Theft React Tote for the purposes of this review, but all opinions are 100% mine.